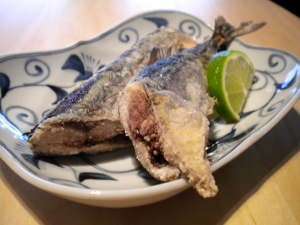 Sanma is the Japanese name for the fish known as Pacific Suary as well as Mackerel Pike. The name written in Japanese literally translates to autumn sword fish. September is considered the peak season for sanma in Japan as this is the time when the fish are fattest. The northern stocks, being the fattest of them all, command the highest price. Sanma is, however, a relatively inexpensive fish. 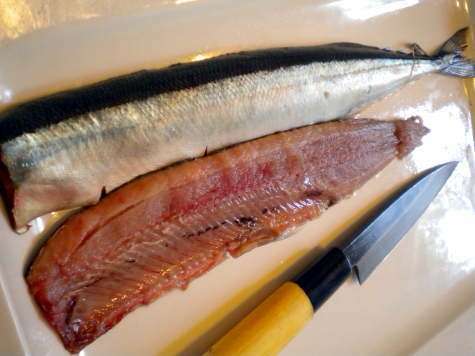 Thanks to improvements in fishing and distribution, sanma is now sometimes served as sashimi or sushi. One typical method is to briefly pickle the sanma in vinegar and soy sauce and make pressed sushi.